Published: May 30, 2014 at 02:23 p.m. Updated: May 30, 2014 at 03:07 p.m.
1. Brett Kern: Fellow punters will one day erect a statue for Kern, who defeated Titans teammate Charlie Whitehurst in an arm-wrestling match for the right to keep his uniform number. There's no coming back from this, Clipboard Jesus. 2. Doug Baldwin: Something of an everyman, Baldwin landed a contract extension with the Seahawks that will pay him $13 million over the next three years. Baldwin is to Dougs what Kern is to punters. Straight hero. 3. Mark Sanchez: Smiling ear-to-ear, the former Jets quarterback told reporters Thursday that Philadelphia "is the best place I could have landed." He ain't wrong. 1. Sean Lee: Just brutal. The linebacker's knee injury is a crushing personal setback and a fairly devastating blow to a Dallas defense that was already suspect. 2. Michael Vick & Geno Smith: Geno has the advantage in this "open competition," but both quarterbacks have received a sneak peak of what awaits them at Florham Park this summer. It's exhausting to even think about. 3. Daryl Washington: The Cardinals linebacker will miss the 2014 season and perhaps beyond after another violation of the NFL's substance abuse policy. When your GM puts you on blast in the team statement, you know you messed up bad. Look at the big man move! Look at those ribs! Listen to those beats! I want to go to there. The likelihood Bernie attempted to play this giant novelty guitar by the end of his pool party: 103 percent. If Eli has any sense of humor about himself at all, he must have this framed and placed in his foyer. It would blow A-Rod's centaur out of the water. Alternate idea: Paint this on Tom Brady's garage. Yep, that's a framed jersey of accused killer Aaron Hernandez hanging in the home of Dolphins center Mike Pouncey, who's never been shy about showing his allegiance to the incarcerated former tight end. This type of home decor isn't going to sway the NFL away from its planned mental health evaluation. LeBron James, an Ohio native, seems awfully invested in the JFF era, doesn't he? "Just like Biggie and Pac, it'll never be settled. Just gotta pick your side and vibe with it." -- Broncos cornerback Aqib Talib's measured take on the eternal Brady vs. Manning debate. Talib has been a teammate of both great QBs. "I'm going to live my life to the fullest." -- Browns quarterback Johnny Manziel, speaking on the topic of his Pauly D-laden Vegas sojourn. "He did catch eight touchdown passes when Tebow was the quarterback." -- Rex Ryan stepping over the rotting corpse of Tebowmania to praise new Jets pass-catcher Eric Decker. We might as well just keep Bad Santa in this spot moving forward. Here's the Saints defensive coordinator again enjoying himself, this time at the New Orleans Greek Festival. His life is basically the male version of Eat, Pray, Love. No, not police officers who ride on Segways, they're just sad. I'm talking about NFL coaches that police the use of Segways. I'm looking at you, Bill O'Brien. Wess offers up some possible name brands who could be moved before the start of training camp. The Boss makes the case why we shouldn't be so fast to crown Nick Foles as one of the NFL's elite signal-callers. You love "GoT"? Then you'll adore this photo essay in which Theon Greyjoy is described as a "once-great ballcarrier." 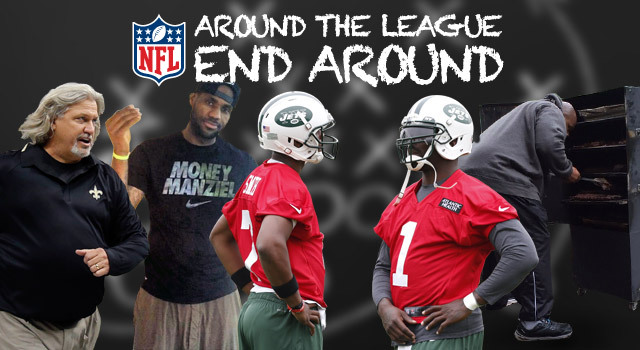 The latest "Around The League Podcast" breaks down the news examines developments from the first week of OTAs.